Before I discuss the game, I would just like to point out that despite my sometimes controversial style and comments in the past, I have not intentionally insulted someone in public. In many ways, I found Sergey’s comments on chesspro to be incredibly disgusting and insulting. One can only hope that people grow up much like I have since my younger days. My translation and comments were originally posted at Mig’s Daily Dirt. Well, I don’t like the Sofia Rules much at all. I’ll give a simple analogy – the tournament in Wijk-aan-Zee, which has conditions on a whole different level to those at the Grand Prix, is played over 13 rounds with 3 rest days and without Sofia Rules. 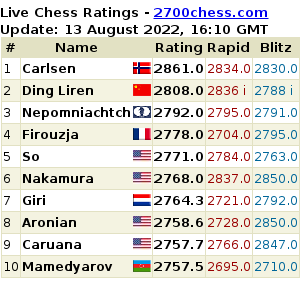 The Grand Prix has fewer rest days and by the end of the tournament all the players have accumulated so much tiredness that the quality of chess is noticeably lower. The prize fund is also less. And watching over you are FIDE bureaucrats who decide if you can agree to a draw or not. Moreover they receive no small amount of money without having to put in much effort at all. Personally for me it’s much more pleasant to play at Wijk. There aren’t that many short draws, but the quality of the games and the “pleasure” of playing there are incomparably higher. Actually it’s not just on draws that Karjakin comes across as “old school”. He also prefers the 6 hour time control and says that he’s not such a child of the computer age as he’s been made out to be – though he mentions the biggest change in chess being that there’s no longer such a category as “unclear” for openings. All of them now have a clear assessment. – What’s your relationship with Nakamura like? Memorable games with him? What sort of person (chess player) is he?